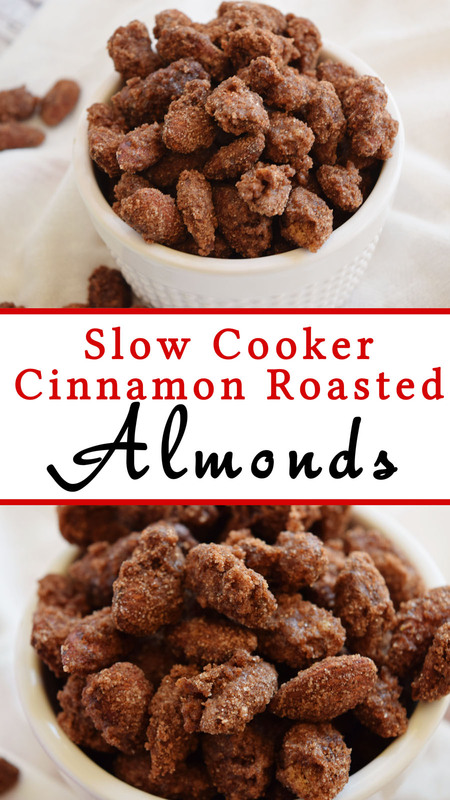 If you love the smell of cinnamon roasted almonds during the holidays, you will love these delicious and easy to make almonds that cook right in your crockpot! Are you getting excited for the holidays? It’s December 1 and Christmas is now if full swing. We have our decorations up, our countdown on, and I’m starting to bake up some of our favorite holiday treats. These Slow Cooker Cinnamon Roasted Almonds are the perfect treat for the holidays and they make your house smell amazing! I personally have always been addicted to cinnamon almonds. They sell them at a local movie theater and in the malls during Christmas. I can smell them a mile away and I immediately start drooling! And if I get a bag, I don’t share. Seriously, I DO NOT share. My kids, my husband, my family… They know to leave my stash alone or there will be consequences. I’m really good about sharing other goodies and food, but not my almonds. They’re mine, my precious (I think I may have been watching too much “Lord of the Rings” lately!). I love how easy they are. You don’t need to turn on the oven, which frees you up to bake up batches of cookies or holiday meal. You can leave the house to get some shopping in too without any worries! These are a fun treat to give neighbors, as favors at a party, or to snack on while watching a Hallmark Channel Christmas movie (anyone else addicted like I am? I have that channel on non-stop!). I love my Cinnamon Roasted Almonds! They end up having this amazing coating of cinnamon and sugar. Combined with the flavor of the almond, it’s the perfect combination. So breakout your Slow Cooker, grab a bag of almonds at Costco, and get ready to make a batch. Be sure when you’re making them that you add the vanilla/egg mixture to the almonds FIRST. Coat them really well before adding the dry ingredients. This assures that the almonds all are coated well with the cinnamon sugar and it gives them a nice crunch. Also, adding in 1/4 cup of water about 2 hours in helps loosen them up and evenly coat the almonds too. It’s so easy, I put together a video. Enjoy! An easy and delicous holiday treat! Mix the egg white and vanilla until frothy. Combine sugar, brown sugar, cinnamon, and salt together. Add amonds into slow cooker. Coat almonds with the egg/vanilla mixture. Stir in sugar mixture and coat the almonds evenly. Cook on high for 3-4 hours, stirring every 30 minutes or so. Add 1/4 cup water in the last hour. Spread amonds on parchment paper and allow to cool.